We celebrate our success but know the work we need to do for the future. Rotary colleagues in Worcester have chosen to let the public know about our polio work with a flash mob. Well it is a flash and freeze. So as many Rotarians that can manage to attend will assemble at a set place and time to stand and freeze to bring to the public's attention the work of Rotary in eradicating the terrible disease of polio from the world. The event will be publicised in the local media and a video is being made for YouTube. All this is being masterminded by Callum Davies from Worcester South, one of this District's youngest members. 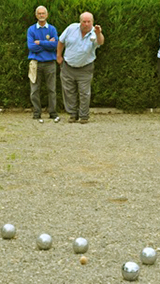 On asking about the flash mob Callum said, "Bringing the work of Rotary to the local public is only part of the effort. It is the use of Social Media with Facebook, Twitter and then YouTube that will eventually get the message across. If what we do goes viral then we would have succeeded in our task and what's more it will be great fun." All the Worcester Clubs were informed of the event this week at a Zone Meeting and all were enthusiastic. Worcester Flash Mob Friday 25th October 12:30pm Worcester High Street. Another two weeks gone and another newsletter. The time is just flying by and what a busy two weeks it has been – such great fun, though. I have visited another 10 clubs since my last missive and again had a lovely time at them all. Each club is so different from the large to the small, to the all male to the mixed gender, from the new to the old, and they are enjoying great fellowship, having fun and raising money for local and global projects. 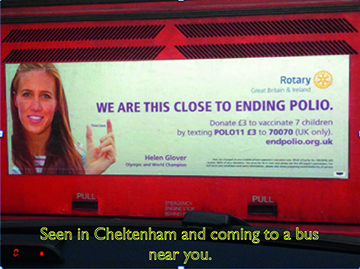 Just a reminder to look out for the end polio now posters on our buses and watch out for news about the flash mobs taking place in all our RIBI districts on Polio Day 24th October or thereabouts. Don’t forget ours is in Worcester on Friday 25th at 12.30pm in the High Street, outside the Guild Hall. Please come if you can. If you wish to read all of DG Jan's Journeys in the district in the last couple of weeks click here. Ade wants to work with Rotary on several projects with polio being just one of them. There are other projects involving wheelchairs and a possibility should his schedule allow for him to make an appearance at the RIBI Conference in Birmingham in March. We will keep you posted as his involvement with Rotary grows. Jill Johnston the International chair for District 1100 writes, " The micros lending project 'Lend with Care' is such an easy way to help small business entrepreneurs in developing countries. You choose the country, the entrepreneur, the sum that you want to lend (minimum) £15). Why not encourage your Club to lend just £200 as a 'tester'?" Click on the picture to see the choice. 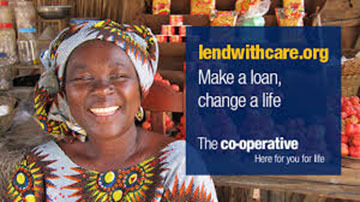 Lend with Care is the micro-lending arm of Care International, and is part-sponsored by Cooperative Group. This is an excellent way to help budding entrepreneurs to start or expand a business; it gives them access to basic financial services + business training. This project is suitable for the individual Rotarian, or a Club. If the entrepreneur needs (say) £1,000 for his/her business, lots of lenders will be involved to reach that sum; the minimum loan is £15. Contact Jill Johnston or for the D1100 Group click here: D1100LendwithCare, or use: www.lendwithcare.org/groups/profile/rotaryd1100. People are joining to make a difference. A number of Clubs have held open evenings recently and used the district publicity material. This was the case with Yate and a satellite Club called Nailsea Miners. If your club is hosting an Open Evening then please let us know. Every event is an opportunity to bring the work of Rotary to the public. Tell them what we do within the community and people will be really wanting to join. The District Festival of Boules was held on Saturday 28th September at the Red Bull, Malmesbury. 12 teams took part, being the 8 Divisional winners plus the top four runners up. There was a random draw to establish the order of play. In the final round, the South Cotswolds A Team beat Gloucester Severn Trows 13—10, and the B team beat the Royal Forest of Dean B Team 13 –8. The remaining match was between South Cotswolds A & B which the A Team won by 13—5. We were not aware of it at the time but it was this match that decided the outcome of the Festival, as this win gave the A Team 5 wins, the only team to have this number. The B Team were runners up with 4 wins, just one point in front of third place Stroud. The participants were very generous with Raffle Prizes and of course buying tickets which raised £250 for the Munday Mission. 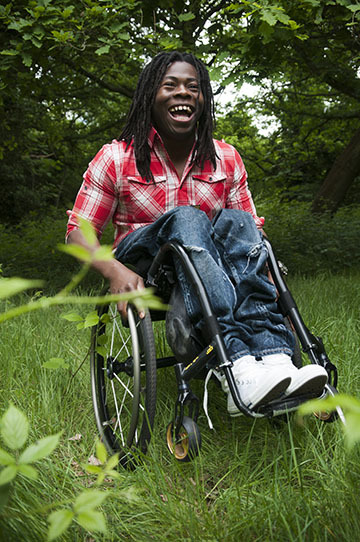 A local charity helping a young man with cerebal palsy. It has received a mixed reception across the world but members and clubs are starting to use it. Sometimes change is not easy to accept but after a long consultation the new branding was thought to be the right way to go. Perhaps it is worth reminding ourselves that it is the perception and knowledge of Rotary by the general public that requires to be enhanced. We would recommend the use of the word Rotary beside the "Make of Excellence" to avoid confusion. We would also suggest that any event your club is holding and participating in is an opportunity to market this wonderful organisation. For more information on using the new branding the District Marketing Team can help.